In the devotional book Revealing Jesus by Darlene Zschech, today's devotional is entitled Your Will Be Done. God doesn't force his will on us. He offers his unconditional love, but it's our choice to accept or reject it. In the humanness of Jesus, he asked God if the cup that contained all sin, all evil and all the pain of mankind could be avoided. He didn't wait for a response. He knew his mission. He simply restated, "your will be done." Jesus showed us how to completely trust. He also teaches us the most important prayer we can utter: Your will, O God. I don't want to be selfish. Watching my brother fight for every day, every moment, every breath is so difficult to watch. Even though it's difficult I would not want to be anywhere else. I watch this man whose funny loving spirit is inside of him but is masked by so much pain. I am afraid of the void he will leave behind. For a wife. A parent. A sibling. But I'm comforted to know that he loves Jesus! He prays constantly to God Our Father. Even in the pain and suffering. There is no doubt that he will see Jesus and look into his Glory. So through tears, a broken heart, I need to pray like Jesus prayed. 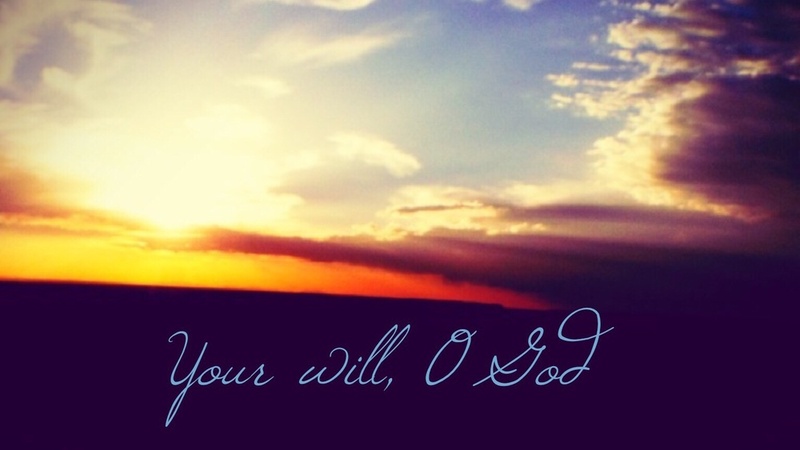 Your Will, O God!